Woohoo five days already! Everyday I think oh its coming to an end ..and then I find a new box of stuff! Okay here is the winner of Day fours bag of goodies! 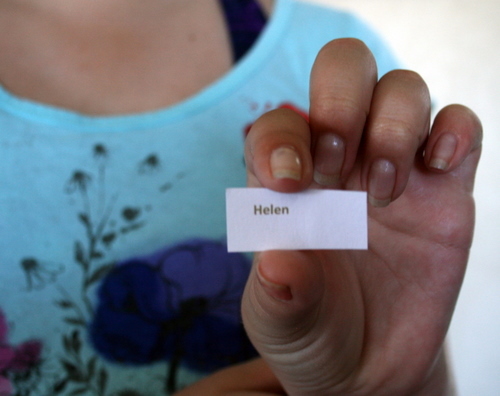 I had two Helens comment but it was Helen McCready who has won (sorry Helen J!) Just because thats a bit sad Im sending you something too. Congratulations Helen McCready. Ill be sending you an email shortly. And onto my Day 5 giveaway. The bag is a SU bag today as the bag I had planned for these goodies was too small! You can see some retired SU goodies there ..ribbon, Ruby red cardstock and subtles retired watercolour crayons. There is HEAPS of stuff in this bag. A die and grungeboard from TH. Lots and lots of yummy stuff! I created yesterday ..did you? I struggled with mojo unfortunately. This always happens when I have a wee break from crafting!. I got my playdate rubons out though and came up with this card. I decorated the inside too. Hopefully I will find my mojo today as have more projects to do for my DT commitments. 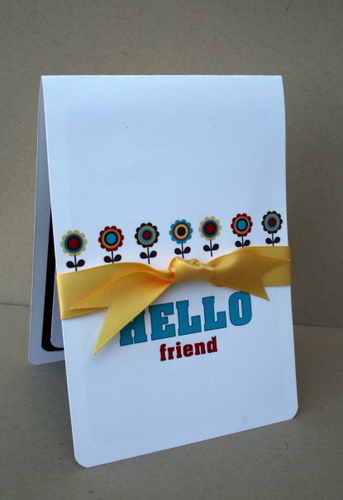 The next couple of days I will have two posts as I show my DT projects as well as my giveaway posts. See you tomorrow! What a great compition and fantastic cards. This has inspired me to sort out my craft table and get back into it after giving birth to my first child 5 weeks ago. thanks for helping me find my mojo! Thanks Tee Jay! I think its back today as Ive made 3 cards and a LO! I know what you mean about mojo missing. I think mine has gone on holiday and I haven’t. Have a great day. Thanks Helen. Hope your mojo returns soon. Will post your parcel tomorrow. Too busy creating today! Thanks for sharing your card today it is lovely. As for the mojo I’m pretty sure by looking at this card yours hasn’t gone anywhere. Thanks Narelle You are too kind! Thanks Karen..actually out of all the bags this one would tempt me to keep as there are some hugely yummy stuff in there..cant wait to see who wins it! What a great idea – a clean out – might even inspire me too – maybe. I am just home from holiday and haven’t managed to create anything for a week or two but hopefully today. Its very liberating Donna I definately recommend it! Fab card, Delys. Crikey you are having a purge with your stash! We all need that sometimes don’t we? Yep I should have done this ages ago Dee but all good for you girls! What a pretty wee card. 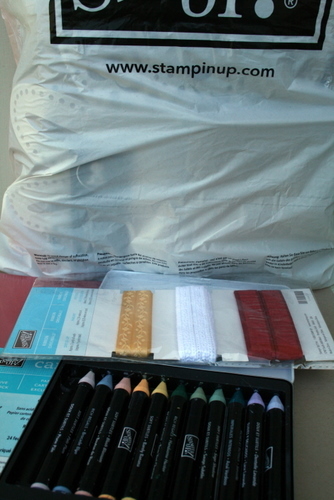 Love the look of the watercolour crayons – I have been using Kaaren’s and they are really neat. Oops! maybe i shouldn’t mention that, hope she isn’t peeking on the comments. Agian great prizes and a great card. Yep had a wonderful day creating today! I was so excited for a moment and then Delys, your generosity showed through. Oh what fun to watch the post. Slow down and find time to smell the roses Delys! Dont worry Helen Ive read 3 books in 2 days..love reading but dont get time throughout the year so its been wonderful to get time to read. Knew youd understand ..thought it was mean not to send you something as well! As for did a creat yesterday, nope only some blue berry muffins, but Tiana did…. I got a beautiful card this morning from her. Yum love blueberry muffins..actually youve reminded me to get some for freezing for muffins. Lol Theresa I thought about TM but cant sell non SU stuff (or current) on there anyway and I just want to get rid of it! Go you on your cleanout! Well done, I managed to finish a mini scrapbook yesterday which was fun! well done Karen! I did a LO today so was happy scrapping again ..need to do some mini albums myself for classes and camps coming up Im teaching at. i love your perfectly clean cards Delys. mine always look grungy!!! 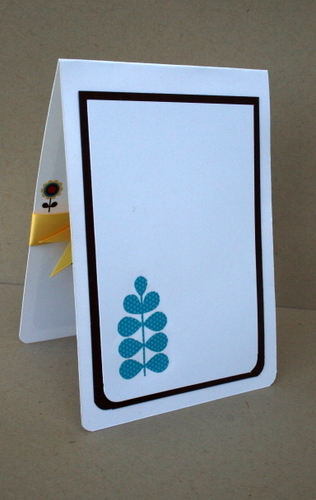 That card is looking good… when you find your mojo can you see if mine is there too? lol yep Ive found mine again today so hopefully you can find yours soon Nicki! Yeah bring on the long weekend of creating aye? Thanks Sue and thank you so much for helping me this year with the Whakatane classes! Good on you Jenny I havent had time yet to do any (but want to) but if any scrapbooker wants to contribute please go to Trina McClunes’ blog for a worthwhile cause. Trina desperatley needs more 6×6 LOs just plain to add the photo. I can’t believe you still have that much stuff to give away! … okay … if I’m honest I probably have just as much here that could easily go to a new home, it’s amazing how much we crafters accumulate! Wow Delys, that is awesome you got to read three books! Which authors do you like? Love your latest card, so sweet and I can’t wait to see your DT work. Wow another great card and another awesome goodies bag, you are the best. You inspired me to get my assignment out of the way almost finished so I can spend a couple days creating something for myself for a change. Thanks so much Dely’s you are a legend. Good on you reading three books I don’t dare read anything other than my assignments or they wont get done. Have a great New Year.